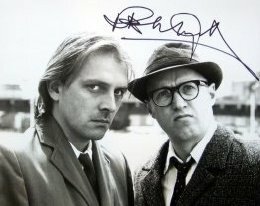 It was whilst at university that he met fellow drama student Adrian Edmondson, who was to become closely associated with Rik in the years to come. When they both left university, the two of them formed a theatre company, 20th Century Coyote, which performed improvisational drama at 'The Comedy Store' in London's Soho. Their brand of loud, 'alternative' comedy quickly got them noticed, and led to them setting up their own comedy club called 'The Comic Strip'. They were joined by Comedy Store compere Alexei Sayle, Nigel Planer, Dawn French, Jennifer Saunders and others, to perform off-beat and crude comedy that drew criticism from many quarters. Between 1982 and 2005, The Comic Strip Presents ran to 5 TV series (30 episodes), with 9 'Specials' and 2 'Feature Films'. The Wikipedia link below gives all the details. Mayall plays Rick, a middle-class student trying to be a radical left-winger, annoying everyone in the process. Adrian Edmondson played an obnoxious and violent punk rocker called Vyvyan, Nigel Planer was a depressed, suicidal hippie called Neil, and Christopher Ryan's character was Mike, bossy and serious. 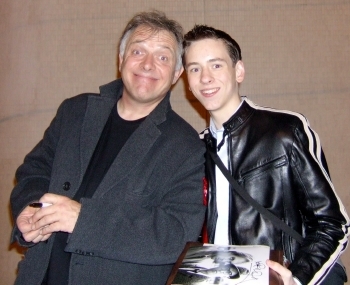 I have always enjoyed Rik Mayall's comedy, so I was delighted to meet him when he was in Bottom at Nottingham's Theatre Royal in 2003. I was amazed at just how much energy he puts into his performances! 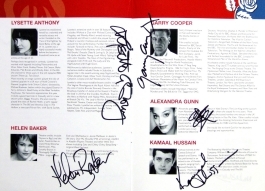 He signed the cover of my programme for me. 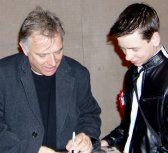 I met Rik again in 2007 when he came to Nottingham with The New Statesman. I was lucky to see him on that occasion because it was his last performance before he had to stand down for a while because he had flu. He signed a photograph for me and then posed for this photo. Rik Mayall married Barbara Robbin, a Scottish make-up artist, in 1985 and they have three children. 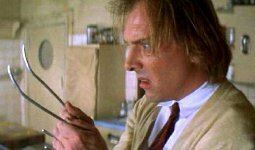 Drop Dead Fred (1991) was meant to be Mayall's big Hollywood chance but the film was a box office disaster. 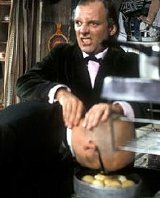 In an interview for Time Out magazine Mayall remarked, "Mums complained that I had corrupted their sons and taught them to wipe bogeys on the furniture." The family moved to Worcestershire in 1961, and Rik later attended the King's School in Worcester. From there, he went to Manchester University where he obtained his degree in drama. 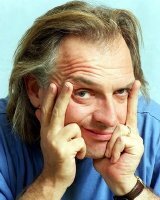 Richard 'Rik' Mayall was born in 1958, near Harlow in Essex. His parents were both drama teachers, so it was inevitable that he would be involved in drama from an early age. 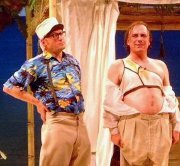 In 2006, Rik Mayall revived the character Alan B'Stard to go on tour with the play The New Statesman, after it had a run in London's West End. 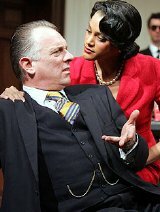 The show toured theatres all around the country, but during its run in Nottingham, Rik Mayall was forced to withdraw from the show with flu and chronic fatigue. In 1991, Mayall and Edmondson appeared together in Samuel Beckett's Waiting For Godot at the Queen's Theatre in the West End. 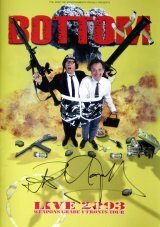 From this came the idea for a similar, but much cruder, TV series called Bottom, for the BBC. Mayall plays Richie Richard whilst Edmondson is Eddie Elizabeth Hitler, and these two unemployed, middle-aged bachelors sharing a flat, indulge in vulgar, toilet humour, with a dose of violence thrown in. essful TV series dating from 1987, but The New Statesman that appeared the same year was one of Mayall's very best. This 28-episode TV series, which ran till 1992, had Mayalll cast as Alan B'Stard, and satired Tory MPs of the Margaret Thatcher era. directed by Adrian Edmondson. Richie (Mayall) & Eddie (Edmondson) run the most squalid hotel in the world, and it is right next door to a nuclear power plant! time - as Mad Gerald in Blackadder I (1983), as Lord Flashheart in Blackadder II (1986) and as Robin Hood in Blackadder Goes Forth (1999). as the Sultan in Carry On Columbus (1992). a coma, but he made a remark-able recovery which enabled him to work every bit as hard after the accident as he did before it. full of the same hilarious vulgarity that is found in Bottom. Rik Mayall died on 9th June 2014.